With scores of mountains, dozens of valleys, and over 500 miles of tracks, trails and paths in the mountains around Zermatt how do you know where to go? On which of the countless routes are you most likely to meet marmots and find edelweiss? Which paths have the finest views and fewest tourists? Where can you see the effects of climate change and learn how wildlife survives the harsh alpine winters? Why are Alpine flowers so brightly coloured? 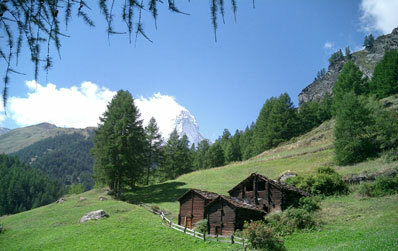 This is why people chose Alpine Zermatt tours: the A to Z of the Swiss Alps. Our walking holidays range from Five Star to Mountain Hut depending on the degree of activity or luxury that you prefer. The cable cars and mountain railways mean that we do not need to start from Zermatt every day but can hitch a lift to higher altitude and enjoy a walk on more gentle slopes. Walks are selected to suit your interests and matched to the season and the weather. The tours are not geography field trips but a little understanding of the mountains, climate and the natural environment will greatly enhance your appreciation of what we see. From time to time I shall be able to call upon the services of other experts who can share with us their own particular knowledge.